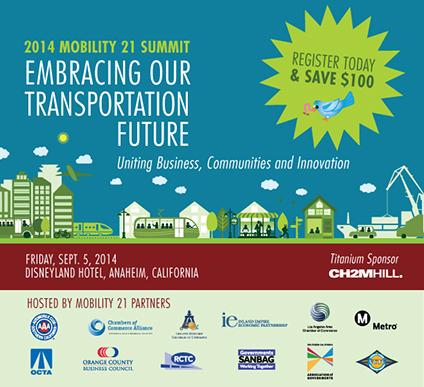 Early Bird registration is now open for the Mobility 21 Summit on Friday, Sept. 5 at the Disneyland Hotel in Anaheim! Join more than 1,000 transportation stakeholders, industry leaders and elected officials at California’s largest one-day transportation event. Hurry, Early Bird registration ends July 18! Discount hotel rates are available to conference attendees! Click here to reserve your room now. Space is limited and the discount is only available until it’s sold out or Tuesday, Aug. 5. Planning on bringing family and friends to enjoy the evening at Disneyland with you after the Summit? Purchase specially-priced Disneyland tickets online! (Student/military personnel registration does not include twilight Disneyland ticket). Sponsor the largest one-day transportation event in California. 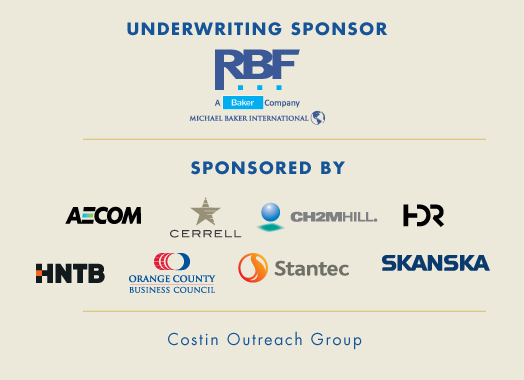 The Summit is the only place where you can mix and mingle with every transportation CEO in Southern California, policy makers and nationally-known transportation experts. Contact Jenny Larios to sign up today. Join us on Tuesday, June 17 in Los Angeles for an evening of networking with the Mobility 21 Board of Directors and Southern California’s top transportation leaders and executives at a welcome reception honoring our new Executive Director, Jenny Larios. 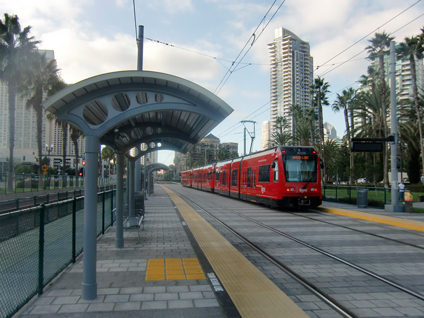 The Trolley Renewal Project improved the quality of life for the local communities in San Diego County by enhancing the form and function of an existing transportation resource. CH2M HILL proudly supports Mobility 21’s goal to provide practical solutions to Southern California’s transportation challenges. CH2M HILL is a pioneer in the planning and implementation of Great Streets, Complete Streets and multimodal transportation solutions helping communities plan, design and revitalize urban roadways for all users – including bicyclists, public transportation vehicles and riders, and pedestrians. CH2M HILL also offers expertise in Performance & Asset Management which integrates current and best-practices of performance-based decision-making with asset management principles and tools. This integration helps our clients invest wisely to achieve both short- and long-term transportation goals while managing costs and increasing transparency in agency decision-making. CH2M HILL has a strong focus on technology as a way to develop the infrastructure of the future including: smart infrastructure solutions, asset management and building information modeling (BIM). Our smart infrastructure solutions go beyond traditional Intelligent Transportation Systems to embrace emerging technologies such as electronic pricing, fare collection and tolling, connected vehicles, and smarter cities that rely on “big data” from our transportation system and provide efficiency through integration. CH2M HILL’s “Smarter Cities Laboratory” is a place to incubate promising technology offerings such as a training demo for road user charging, complete with in-vehicle distance devices, servers, and software to issue monthly bills for road usage fees, tolling and parking. The first offering of this lab was the “Smart Surface Transportation” or Intelligent Operations Center Demonstration for Los Angeles. 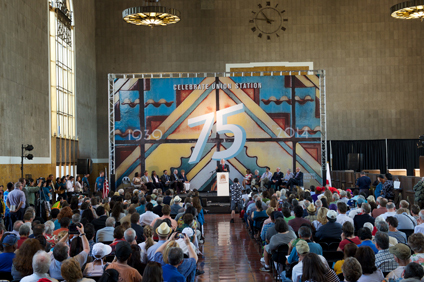 Metro, Amtrak, Metrolink and elected officials gather to celebrate Union Station 75th Anniversary and National Train Day with festivities for the entire family and cultural events throughout downtown Los Angeles. Real and model trains and train memorabilia, vintage rail cars, live entertainment, station tours, bike rides, a Chuggington Kids Depot, the Amtrak Exhibition Train, featuring more than 40 years of history of America’s Railroad, and more were part of the Los Angeles Union Station 75th Anniversary celebration and Amtrak’s National Train Day festivities May 3 at Union Station in downtown Los Angeles. Click here to watch a video of the event. A little warm weather did not prevent an estimated 75,000 visitors from events at Union Station and other venues in downtown Los Angeles. Cultural activities were open to the public at Little Tokyo, Mariachi Plaza in Boyle Heights and Cinco de Mayo festivities at Olvera Street. At the L.A. Public Central Library, the Getty Research Institute opened a show of original drawings and photographs of Union Station. The show runs through Aug. 10. Free rides from Union Station to downtown venues were sponsored by the Annenberg Foundation, which has partnered with Metro to help build community through public transportation. TAP cards pre-loaded with $3 were distributed to the public at the 75th Anniversary event so that they could explore Los Angeles and learn how public transit can work for them. Crews work together to fight flames caused by construction activity on the Ranchero Road Interchange Project in San Bernardino County. The approximate $59 million Ranchero Road Interchange Project started in January of last year and was scheduled to continue through Fall 2014. On May 5, construction activity resulted in a fire that ultimately consumed a significant portion of the bridge support structure, known as false work. 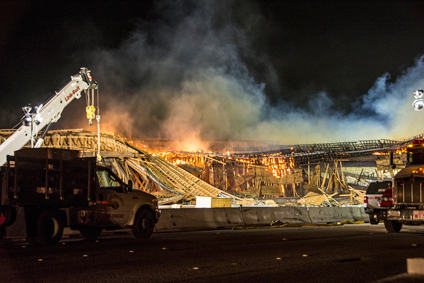 Interstate 15 was closed in both directions while San Bernardino County Fire, assisted by Caltrans and the project contractor, fought the blaze and began to remove the fire-damaged material from the travel way. Northbound I-15 was ultimately reopened to traffic 28 hours later at approximately 5:20 p.m. on May 6. Crews then completed clean up on the southbound side of I-15 just over six hours later at approximately 11:45 p.m. Since then, the San Bernardino Associated Governments (SANBAG), City of Hesperia, Caltrans and the project contractors have been diligently working to develop a plan to complete construction of the project. Based on the preliminary results of inspections and testing for damage to remaining elements of the bridge, the contractor has indicated that they plan to complete all work on the project by the end of the year. Construction crews will be doubled in some cases to help increase productivity and reduce the overall construction window for the project. Crews have begun replacing the falsework for constructing the bridge portion of the interchange. Other tests on the columns and abutments remain ongoing, but can be conducted concurrent to the initial stages of the falsework placement. The multi-agency teamwork both during and after the fire should be applauded as all parties worked together to minimize the impact to traffic, the local community, the freeway system, and all the other stakeholders of this much-needed, much-anticipated project for the High Desert. Liquefied natural gas (LNG) is one of the most promising alternatives to conventional diesel fuel for trucks. 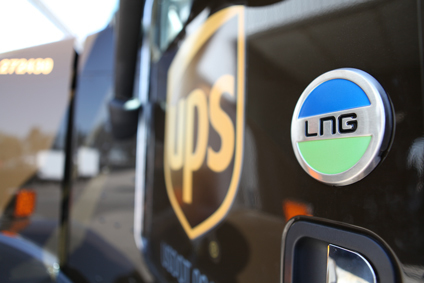 UPS has used natural gas vehicles for more than a decade and continues to invest in infrastructure needed to make LNG a bigger part of its global logistics network. UPS announced plans in 2013 to invest approximately $50 million to build 13 LNG fueling stations that should be operational by the end of this year. The enhanced infrastructure will support the operation of approximately 1,000 UPS LNG tractors that will displace more than 24 million gallons of diesel fuel annually. UPS has one of the largest private alternative fuel fleets in the nation with more than 3,150 alternative fuel and advanced technology vehicles. Since 2000, these vehicles have driven more than 295 million miles – and the company aims to drive 1 billion miles in its alternative fuel and advanced technology fleet by the end of 2017. 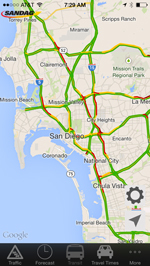 San Diego County residents now have a free tool in the palm of their hands to help them avoid traffic headaches. Earlier this month, regional leaders unveiled the 511 San Diego mobile application that offers commuters information about all things traffic, including real-time traffic alerts and traffic camera views, FasTrak tolling prices and Metropolitan Transit System (MTS) bus schedules and fare prices. Through the app, users can find advance notifications of conditions that cause traffic jams, such as lane closures or stalled vehicles, and alternate routes to get around traffic incidents. The text-to-speech function of the app allows users to receive the information without looking at their smartphone screens. Click here to read more about the app. Join FuturePorts for an interesting discussion of important topics facing Southern California’s goods movement industry. Hear from experts from the Ports, government and regulatory agencies, community and business who are finding ways to reach common ground to ensure California’s success for a healthy economy and environment. ARTBA: National Convention, Terranea Resort, Rancho Palos Verdes, Calif.